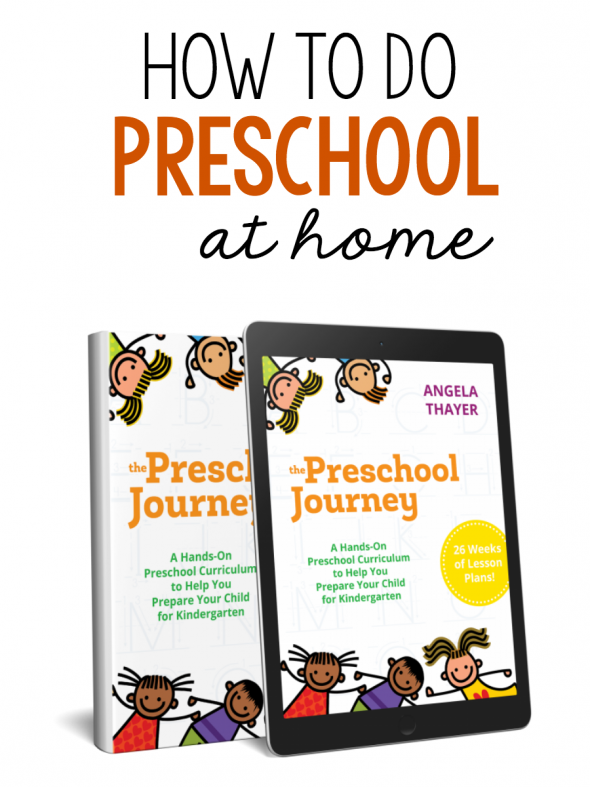 Are you looking for fun learning ideas to supplement your child’s day at preschool? Maybe you’re teaching your preschooler yourself. How do you begin? 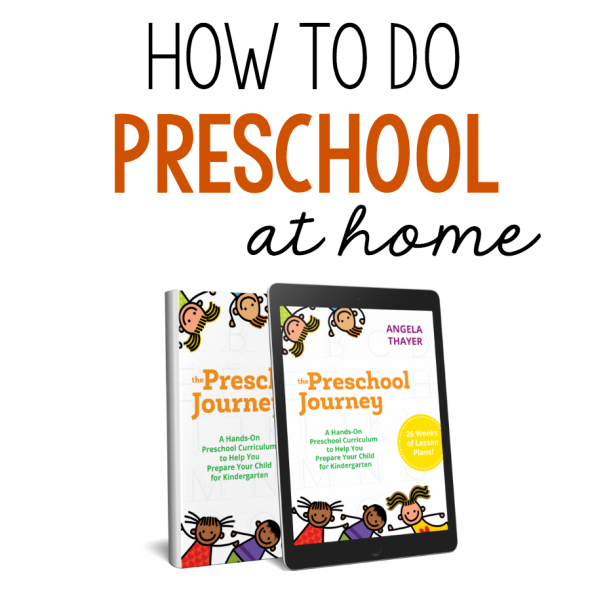 An excellent way to start is to get this complete preschool curriculum for home! 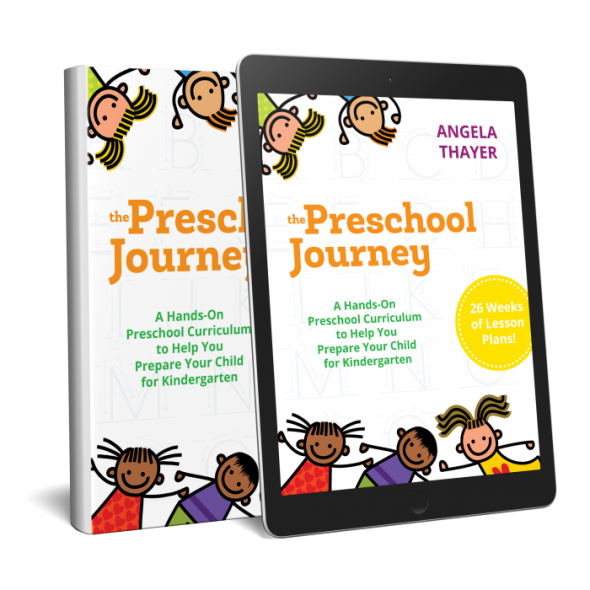 The Preschool Journey is a time-saver for busy parents. Researching what craft to do for each letter, finding literacy connections, getting ideas for sensory play — it all takes time. I’m an educator and a blogger – I love that sort of thing! But for many parents, it’s neither enjoyable nor practical. No worries! Angela has done it all for you. I love Angela’s philosophy (because it’s mine too!). Young children learn through play. They don’t need pages of worksheets and busywork. 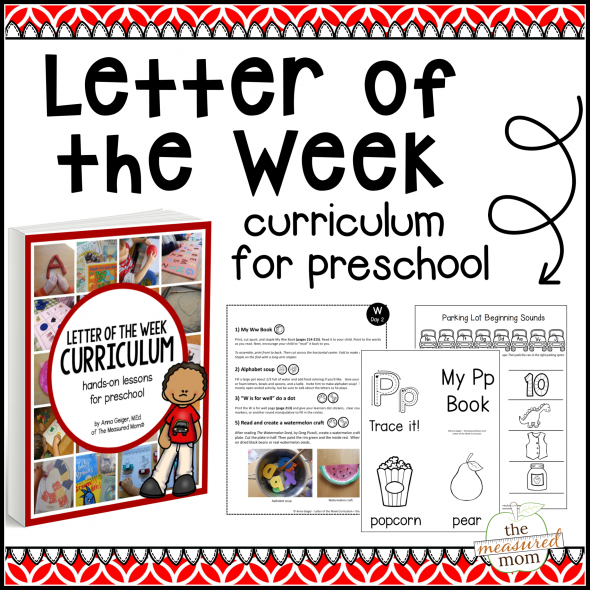 Preschoolers learn best with playful activity centered around the alphabet, math, literacy, and social skills. And that’s just what you’ll find in The Preschool Journey! The book’s layout is simple, accessible, and beautiful. Feeling overwhelmed? This book will put you at ease. 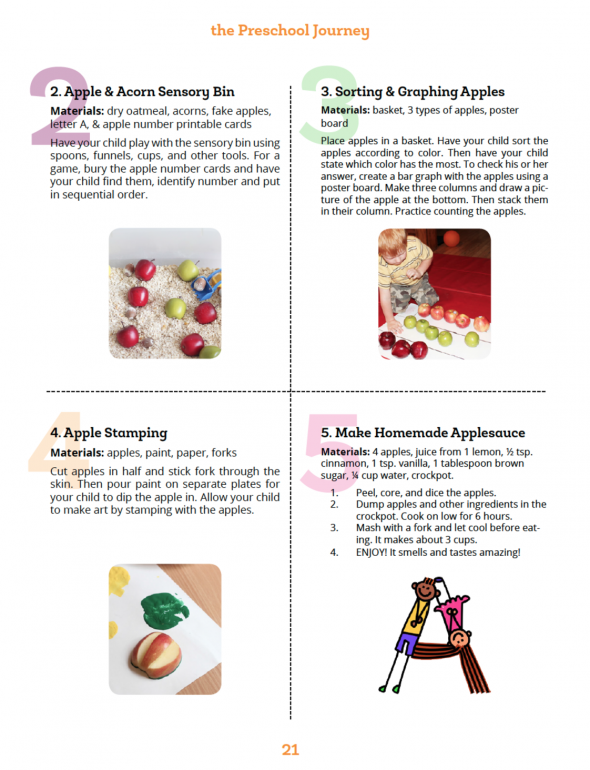 The printables offer a great variety of learning activities. You’ll find math mats (for counting goldfish crackers or sorting jelly beans, for example), playing cards to practice rhyming, and more. You’ll also find a few traditional worksheets for scissor and pencil practice. Each lesson plan includes a suggested craft. 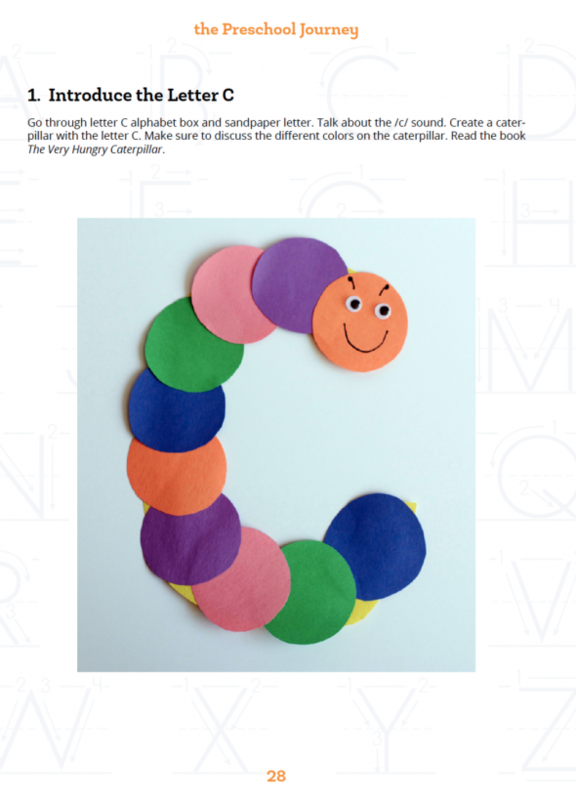 Crafts that take the shape of a letter are excellent for reinforcing the letter’s shape and sound! A quality preschool curriculum will keep literacy at the forefront. 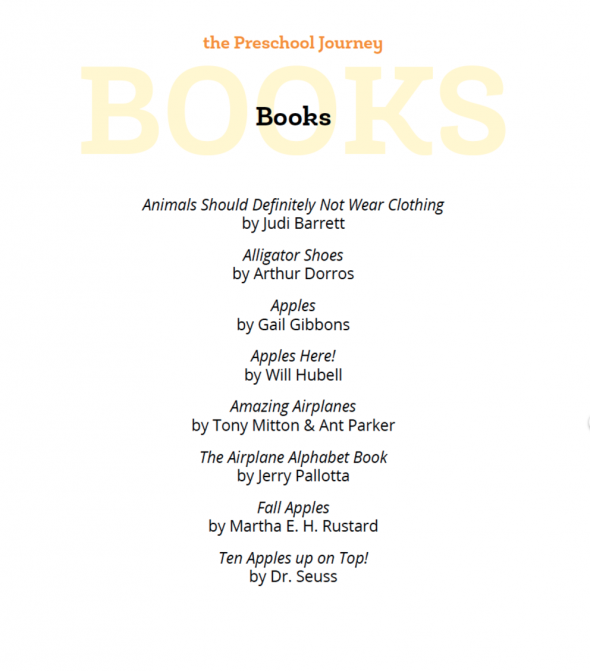 Each lesson contains a book list related to that letter. Love it! No worries that the printables will lead to boring seatwork — like these adorable dinosaur clip cards, they’re designed for hands-on learning. *Disclosure: I was given a free copy of this ebook in exchange for an honest review. All opinions are mine! This looks like such a fun preschool program. I’ll definitely look into it more. Thank you so much for reviewing my preschool curriculum! I appreciate your kind words! It looks like a wonderful book!! Thank you for sharing at Sharing Saturday! Hello, Heather! I’m so sorry it took so long to reply to you. I was looking for the comment and couldn’t find it! You asked what I recommend for age 1 1/2. First of all, I definitely would NOT recommend a curriculum. At this age, you do not need to formally focus on your child gaining academic knowledge. However, I understand what you mean about needing a guideline. What you might want to do is write down your goals for the week. Each week, make a point to 1) read every day, 2) have some kind of sensory play at least once, 3) have some kind of fine motor activity that your child can handle, 4) have an experience together where your child can learn something new – that can be as simple as going to the grocery store and visiting the deli! I firmly believe that LOTS AND LOTS of reading and talking about books will help your child know everything he needs to at this age. Feel free to write back with more questions if you like – will work to be more prompt this time!